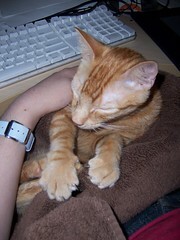 I figured since TheDon has rescued dogs covered in this blog, I’d throw a rescued cat into the mix. My cartoonist fiancé Masheka and I are off to Washington, DC for the 50th Anniversary Convention of the Association of American Editorial Cartoonists. We’ll be hanging out with the Cartoonists With Attitude crew (AAEC Vice President Ted Rall, plus Keith Knight, Jen Sorensen, Matt Bors, Brian McFadden, Stephanie McMillan, Ruben Bolling, August Pollak, Ben Smith) and a huge convention of famous-type editorial cartoonists (Tom Toles, Joel Pett, Clay Bennett, Signe Wilkinson, Rob Rogers and many many more!) plus special guests like Tom Tomorrow, Duncan Black and the Comics Curmudgeon. I may even bring a laptop and blog about some of the panels. In our absence, I leave you with this photo of our newly rescued cat, Octavia, kneading me with her claws as I try to finish up the Cartoonists With Attitude Slideshow for our event this Saturday. We’ve felt for a while that our other cat Riley was lonely and just too friendly and social and playful to stay home by himself while we’re at work. A rescue group in our neighborhood saved this little orange fuzzball from the euthanasia queue at Animal Care and Control. We barely had her home for a few hours before she decided she had to sit in one of our laps 24/7. We named her Octavia to (a) pay tribute to the late great science fiction writer Octavia Butler and because (b) she seems like one of the weird alien creatures from Ms. Butler’s books, with her giant orange eyes, her taillessness (she’s a Manx cat, and apparently this is how many of them are born) and her weird bunny-style gait. Her political affiliations are yet to become clear, but hopefully she’ll be more progressive than our other cat. I must add that lazy and unapologetic as other other cat is, he’d never have pardoned Scooter Libby.